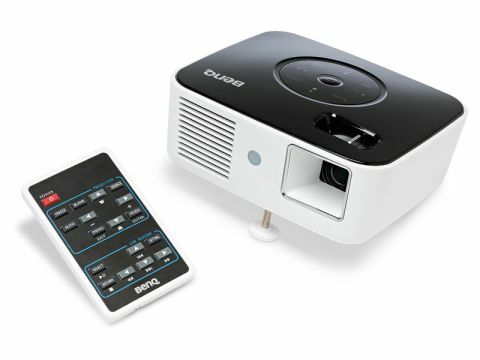 Can Benq's dinky little projector win us over? Projectors are generally predictable beasts, and not in a good way. They tend to get progressively more rubbish the longer you own them, and it's usually the bulb that's the main problem, provided you don't knock the lenses out of alignment by kicking the thing around. You'd be justifiably annoyed if you paid over £400 for a TV, which got darker and darker before dying after a few thousand hours of use, leaving you with a bill close to half the price of the unit just to watch Peter Sissons making his way through another news broadcast. There's no reason a projector should be able to get away with such abysmal performance. And given the awesome showing of the Joybee GP1 (which eschews the traditional bulb in favour of a cluster of ultra-bright RGB LEDs, flickering on and off in sequence with the image on-screen) we reckon the bulb's days could be numbered, at least at the low end of the projector market. BenQ's new fangled LED setup is designed to last 20,000 hours, and therefore isn't meant to be replaceable, which is fine with us. On the one hand, this mini setup is no competition to a proper projector. Producing only 100 ANSI lumens, it's not nearly as meaty as higher-end models with real bulbs. Indeed, we struggled to stretch the picture much bigger than 60 inches diagonally without it dimming to an unacceptable level. On the other hand, as a purposefully portable unit, this thing really shines. Automatic keystone correction coupled with colour balancing based on the hue of your projection surface, makes it supremely useable in the field. It doesn't, however, have an internal battery, the power adapter's a fairly large lump and there's no space for it in the included carry case. There's a combined VGA/composite cable included in the box – the VGA port presumably being provided in cable form to save space on the unit and make sure its single proprietary AV port is also compatible with the separately sold iPod dock. This adds another component to carry around. Niftily, it can play videos directly from a USB source but annoyingly – perhaps stupidly – movie playback seems restricted to MPEG-1 or MJPEG; formats that nobody uses. ArcSoft conversion software is included in the box and does the job admirably, but native DivX and XviD support is so sorely missing that you're likely to take a laptop along to wherever you're showing your video off. With all these extras, this portable projector quickly expands to take up a rucksack full of kit. And at around £450, even with that nigh-eternal lamp, you have to ask yourself whether you'd get more from a full-priced proper projector. At the very least, more brightness, ports and pixel power. Optoma's 720p HD700X, for instance, is only £50 more and offers proper 720p resolution and an HDMI port, which means that as decent as this little unit is, it just can't keep up.